Daisuke "Pixel" Amaya is one of just a few Japanese names in the indie gaming pantheon, after developing 2004's Cave Story entirely on his own as a labor of love. 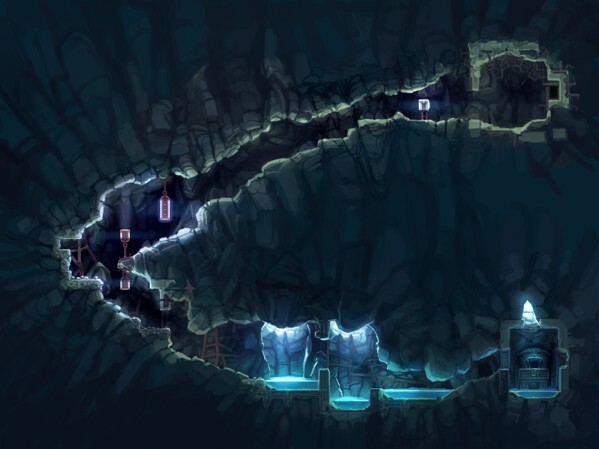 This year, he came to the Game Developers Conference to present a long-overdue postmortem about the development of Cave Story and to promote the upcoming 3DS remake, which he's working on with developer Nicalis and publisher NIS America. During this presentation, Amaya showed never-before-seen footage of a beta version of Cave Story, including locations, characters, and enemies that didn't make it into the beloved indie game. Soon after the presentation, we sat down with the game designer, and found out that despite the popularity of Cave Story, he still has a day job. For now. " I still work full time as a salaryman," Amaya told Joystiq, "but from April I'm going to be a full time developer." He explained that he planned to leave his job as a programmer for large-scale printing equipment a year ago, but "everybody was like 'are you really okay with developing games?' They weren't really sure if I could support myself." As he also had to train his replacement, his transition to full-time game designer was delayed. " I have a wife, I have kids, so [his co-workers] were a bit worried. It's not like they doubt my skill." But now he's ready to devote himself to making games, including Cave Story 3D, which is done in collaboration with Nicalis, the team that remade Cave Story for WiiWare and ported it to DSiWare last year. " I'm directing every element of Cave Story 3D," he said. "Also, I sometimes draw something original for concept art." With Nicalis, he's also working on DSiWare versions of his games Guxt and Ikachan. In addition to his duties with Nicalis, "I'll be working on my own, too," he told us. Amaya demonstrated an iPhone game he's making himself, in which a fish swims through spike-filled water. " In Japan, Android seems to be more popular than iPhone," he mused, "but to make a game on Android, I have to use a different development system for different phones [to handle things like gamepads]. But for iPhone, there's only one." Amaya saw the announcement of the 3DS as "great timing" for a modern-style remake of his best-known game. He'd wanted to do it for years -- and, in fact, considered using polygons himself for the original -- but opted for the throwback style that won so many hearts largely out of practical concerns. "When you make 3D graphics, you're going to have to do a lot of stuff," he explained. "Since I was making the game by myself, I had to scale down the things I could do. So I went to a retro style," he said. He similarly downlplayed the impact of the music, which has been well-received enough to inspire a multi-disc remix album. "I'm not a professional musician, so I wasn't able to make that great music," he said. "I'm really happy that it's received really well. I don't think that I can use the original music for Cave Story 3D, though, so I'm fine with rearranging the music." There's also unspecified "additional content" to be found in Cave Story 3D, though Amaya couldn't offer any details. And for those concerned about the parties, jumping is now mapped to the B button. Counting the beta and the WiiWare remake, Amaya told us this is the fifth version of Cave Story he's worked on. And after refining the original game to a high polish, he told us that he was "thinking of a sequel." He currently has two ideas about the content in the sequel, but he was unwilling to give those up as well. Others have made versions of Cave Story besides Pixel. Before the DSiWare version (or the WiiWare version) was announced, "Ravenworks" of the LiveJournal Cave Story fan community began a homebrew DS port, to be played using the often vilified DS flashcart. Upon discovering that Amaya had yet to pick up a DS of his own, Ravenworks and the community pitched in to buy him a black DS Lite in 2008, which was laser-engraved with Cave Story characters and loaded with the work-in-progress homebrew port. "I still have it," Amaya said. "I want to use it, but you know, when you use the device, it could break or something, so I just keep it in the box."